The Castle of Kintzheim dominates the small village of Kintzheim. Loacated not far from the famous Castle of Haut-Koenigsbourg, this beautifully restored castle ruins are a magnificent sight to behold. 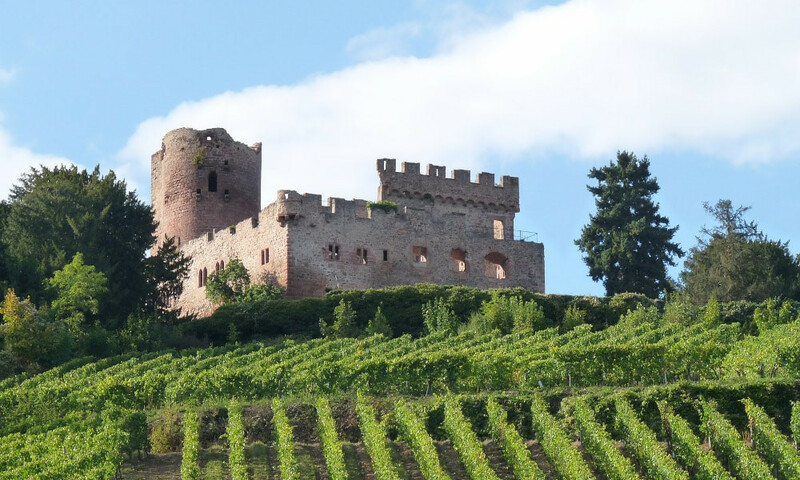 Although Kintzheim is known since the 6th century, when it was a vast domain owned by the Merovingian kings, the actual castle originated in the 13th century when Emperor Frederick II of Hohenstaufen ordered the construction of a fortress. The keep was finished in the 13th century, while other residential structures were built during the 14th and the 15th centuries. In 1492, on the order of Emperor Frederick III of Habsburg, the castle was sold to the town of Selestat; it then changed hands several times until a decree of Emperor Napoleon I gave Kintzheim to Mathieu de Favier, who was obliged to pay 2,000 silver marks to the town of Selestat. The romantic movement of the 19th century brought back to life many medieval castles across Europe. While the nearby Castle of Haut-Koenigsbourg was completely restored on the order of Emperor William II of Germany, the ruins of the Castle of Kintzheim were consolidated by German architects as well. Today, visitors can still see the round keep, imposing living quarters, a vaulted cellar, and a chapel built in Gothic and Renaissance style. Besides that, the castle of Kintzheim is home to the famous La volerie des aigles (eng: Eagles Nest) - an amazing spectacle during which the world's largest birds of prey (including eagles, falcons and vultures) fly completely free to entertain the audience.